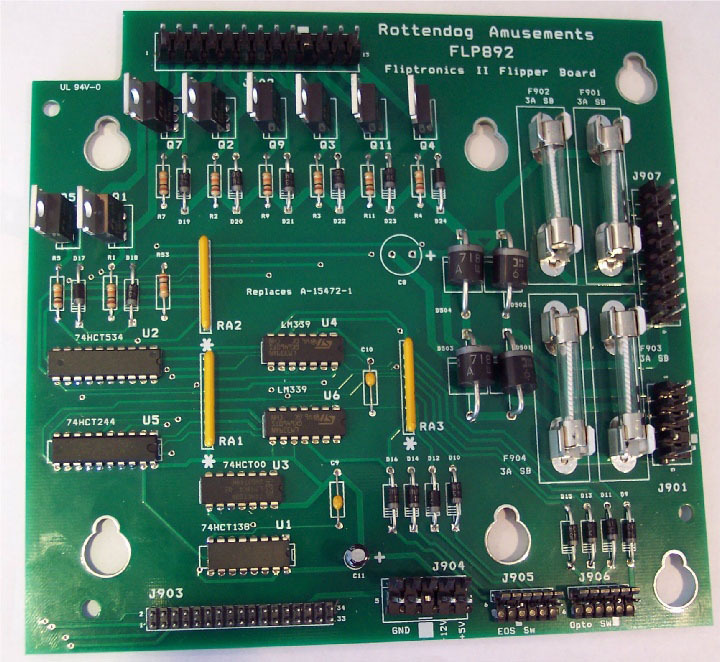 Fliptronics flipper control circuit board. Used in many Bally and Williams games from approx. 1992 - 1996 (see game listing below). This item is an aftermarket replacement part which substitutes for the original factory Fliptronics I and Fliptronics II boards which are obsolete and no longer available. Will also replace Fliptronics I boards used in Addams Family and Addams Family Gold games (see Fitment Note below for details). Replaces original board #s A-15472, A-15472-1, A-15472-2, A-15472-AI, 16-8850-438, 16-8850-439, 16-8850-459. FITMENT NOTE: When used in Addams Family or Addams Family Gold, fuses on the board (4) are not required, the two connectors on the right edge of the board are not used (J901 and J907), and the game's 4-pin ground connector (4 black wires) will be left unconnected.